The attachment of the small protein Ubiquitin is one of the most abundant post-translational modifications in eukaryotes and plays a role in virtually all signal transduction pathways. Ubiquitylation marks proteins for degradation to control the abundance of key regulators in the cell and thus plays a role e.g. in cell cycle transition and the establishment of protein gradients in polarized cells and developmental processes. Aberrant ubiquitylation enzyme function gives rise to cellular dysfunctions that cause numerous human diseases. Although the basic principles of Ubiquitin protein modification have been identified, the exact catalytic mechanism of the ubiquitylation reaction is still unclear. An important biological process that involves protein ubiquitylation is the establishment and maintenance of cell polarity (figure 2). Almost all cell types in multi-cellular organisms are polarized, i.e. exhibit an unequal distribution of their molecular components. Loss of cell polarity is one of the most fundamental mechanisms of cancer metastasis. Although polarized cells differ substantially in their morphology and function, it is an evolutionary conserved interaction network of polarity proteins that mediates polarity. We study what regulates the interactions, localization and activity of polarity proteins. This may enable us to manipulate polarity protein function with small organic compounds and offer new options for cancer therapy. Figure 2. Localization of Par-3/Par-6/aPKC complexes in polarized cells. The asymmetric distribution of cell fate determinants enables cell differentiation (upper left panel), while the spatial and temporal restriction of morphogen- and cytokine-receptor interactions directs cell migration during embryonic development and immune surveillance (upper right panel). 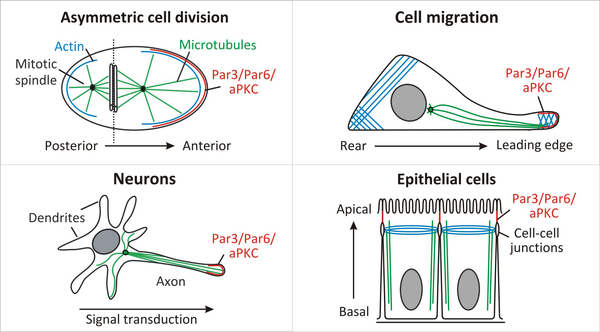 Furthermore, spatially and functionally restricted subcompartments underlie the function of neurons (lower left panel) and epithelial cells (lower right panel). Using NMR spectroscopy and / or X-ray crystallography we gain insight into the 3D structures and motions of proteins at atomic resolution. This structural information forms the basis for in vitro and in vivo experiments to address functional aspects. Our group has access to a 600 MHz and an 800 MHz NMR spectrometer, both installed at the institute in 2008, to an in-house X-ray source, a honeybee crystallization robot, and measurement time at the Swiss Light Source synchrotron in Villingen, Switzerland.